Who is ready for the Christmas recipes to start? 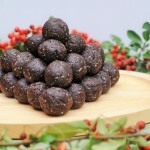 I know it is a little early to start talking about Christmas, but it's never too early to start looking for healthier Christmas treats - especially these Vegan Truffles! Put the cashews in to a high powder food processor and blend until a chunky powder. Add the rest of the ingredients and blender until blend until smooth. Roll in to 40 truffles.